Water/methanol injection for gas engines is a proven means for effectively reducing engine inlet air temperatures and suppressing harmful detonation on forced induction and high performance naturally aspirated race engines. This allows racers to reliably increase boost and advance ignition timing -without using high-octane racing fuel- for power gains of up to 20%. Mouse over the image to view the back of the controller. bases injection flow on manifold pressure using an on-board MAP sensor (up to 35 PSI of boost) to ensure the proper amount of water/methanol injection at all points along an engine's power curve. AEM's engineers spent extensive time developing the controller's flow control strategy for a more linear flow output delivery. This means that the flow delivery better matches an engine's need for water/methanol injection, which further optimizes charge air cooling and detonation control. 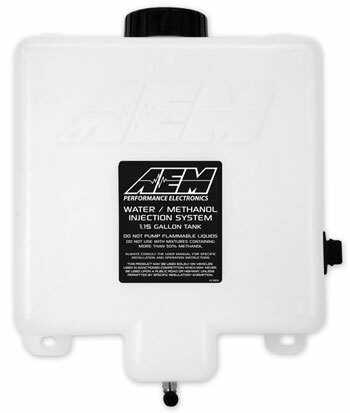 AEM's internally-bypassed water/methanol injection pump does not cycle on and off and provides quiet, smooth operation. It features robust construction including integral hose fittings, EPDM seals and a Santoprene diaphragm that provides consistent and reliable fluid delivery. The new gasoline WMI tank was redesigned offering 15% more capacity compared to the previous 1- gallon design (1.15 gallons vs. old 1 gallon tank). It comes with an anti-starvation reservoir that collects fluid near the feed fitting at the bottom of the tank, and features relocated mounting holes that fit within the overall footprint of the tank. 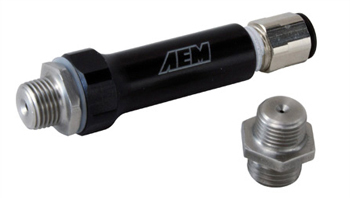 AEM includes one precision-machined billet injector in its gasoline Water/Methanol Injection kit. It features an integral check valve to prevent unintended fluid flow. 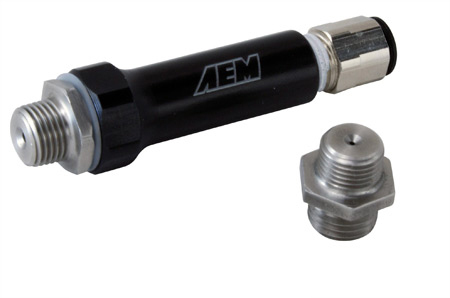 Three billet injector nozzles are included for matching water/methanol flow to an engine's horsepower output. 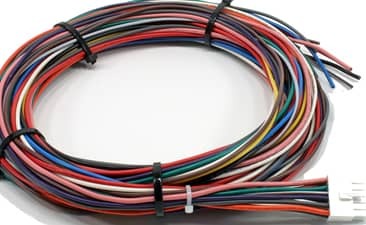 AEM's Water/Methanol Injection kit's wiring harness is terminated with a positive-lock connector on one end and has color-coded wires to ease installation. 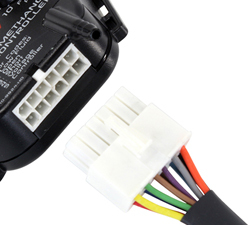 Both the power and ground wires for the pump are included in the harness which simplifies the wiring process and eliminates any chance of the pump accidentally activating from a short in the system. 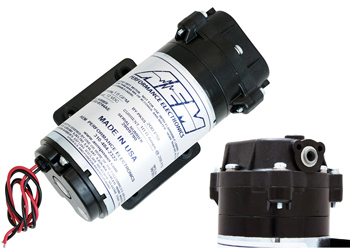 An additional wire is included for adding an optional on/off solenoid to stop fluid flow when the system is inactive. I could not be happyer with this purchase. My truck is running better than ever and the power is unbelievable. If you want to get safe power out of your truck this is a must have! Thanks again to Mike and all the guys for helping me get this truck where it is. I love it. 2011 super crew 4x4 lariat white platinum tri coat.Tonneau cover. Bed rug. Leveling kit. Air bags. UPR catch can. AFE intake. Stainless off road Y pipe. 170* thermostat. AEM meth injection. And of course MPT tunes! I've had this product installed on my truck for about a month now. The kit is good. But what you really get is the knowledge and experience that comes with MPT. These guys are great. They went back and forth with me data logging until it was just right. The only problem is trying to keep my right foot under control. Q: What kind of mile range can you expect with a 1 gallon tank with each nozzle? A: It's going to depend completely on how aggressively you drive, as the controller is setup to begin flowing once it measures a certain boost pressure. Was this answer helpful? 5 of 11 Customer(s) found this Answer helpful. Q: I would like to run a water/methanol setup just basically to clean my intake valves on my f150 3.5 exoboost. Is tuning required for an application like this or can the wideband O2s adjust for the amount needed? A: ECU tuning is not required for water/meth injection. Probably best to use the small nozzle in the kit if you're not tuned for it. Q: Can this be fitted to a 2015 eco boost mustang ? A: While we haven't tested this specific application, it should work great. The controller has a built in MAP sensor so you can set it to flow at a certain boost pressure. Water/meth injection is an excellent addition to any turbocharged setup. Benefits include lower charge temps and improved resistance against pre-ignition. 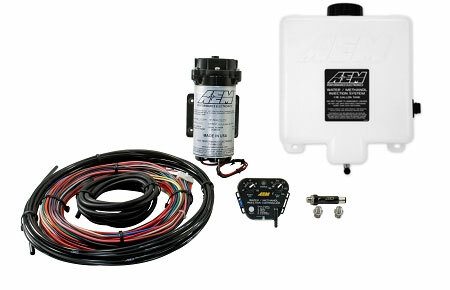 Q: will this kit work with a 2012 3.7 mustang? 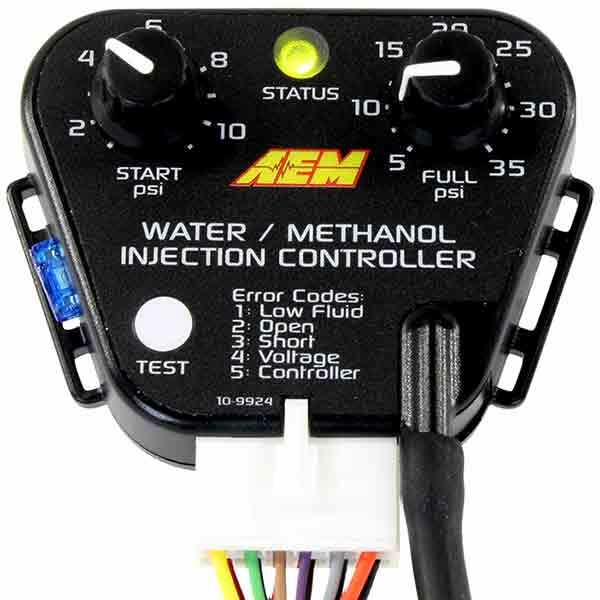 Q: Will this water methenol kit work on a 2016 2.7l f150 ecoboost? Also I'm at nearly 420 hp in this truck. It comes stock 325, what is the point at which I should fear of blowing my motor? A: Yes, its a universal kit that will work great on just about any turbocharged vehicle. Currently there is not enough data to give a meaningful hp limit to this motor. Q: How would I go about installing this on the 2016 2.7l f150? Also is a tune for this kit necessary? Because I bought a tuner from stage3motorsports only to figure out they got like 5 items in Stock for performance. How muchave horsepower does this add? A: Instructions on how to install this kit will come with it. Tuning is required with use of Water Methanol. However, we do not offer tunes for the 2.7L Ecoboost at this point. We have not tested water methanol on the 2.7L Ecoboost engine specifically. On the 3.5L Ecoboost, it adds around 40-45hp.